For those who prefer to avoid the crowds of more popular parks in favour of a remote, intense and authentic safari experience, the Kgalagadi Transfrontier Park is an obvious choice. This huge tract of desert lies on the South Africa-Botswana border and was formally created in 1999 when adjoining national parks from both countries were combined. This less-frequented park offers the opportunity to spot wildlife in a dramatic desert setting and is ideal for those hoping to see more animals than tourists on safari. The huge wilderness area of this park offers excellent opportunities for viewing wildlife. 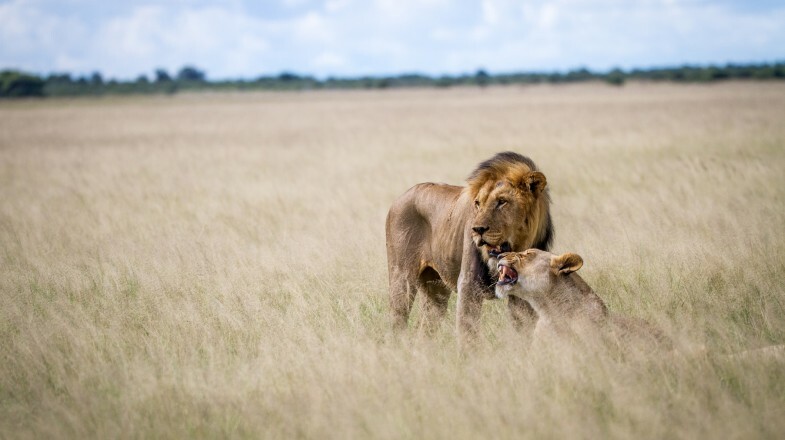 In terms of large predators, the park contains populations of black-maned Kalahari lions, leopards and hyenas and is considered a particularly good place to see cheetahs. 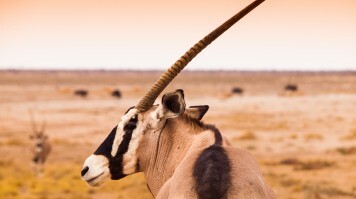 Other large mammals include blue wildebeest, springboks, eland and the gemsbok. Around 200 species of bird are also present, including vultures and various raptors. 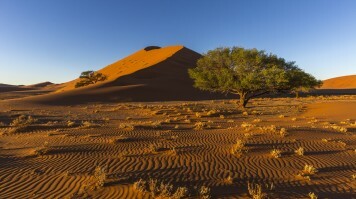 The park lies completely within the southern part of the Kalahari Desert. The landscape consists of dramatic desert scenery of red dunes and sparse drought-resistant vegetation including grasses and camelthorn trees which survive on subterranean water. It is an intense, striking landscape that is highly photogenic – but it can become monotonous after a while. For those in search of a true wilderness experience, this park will not disappoint. Within the vast lands of the park, there are only a handful of lodges and camps and driving times between them is measured in the hours. The park receives far fewer visitors than more popular safari destinations, making this the place to come if you are searching for a truly authentic experience. Since the park is located in the Kalahari Desert, a land of extremes, visitors on a Kgalagadi safari should be prepared for blisteringly hot days in summer or freezing nights in winter. The landscape is equally intense and the lack of water allows only the hardiest plants and animals to survive. That said, well-adapted flora and fauna still manages to thrive. A Kgalagadi tour is suited for serious wildlife enthusiasts rather than those hoping for a pampered holiday – although luxurious accommodation does exist. The remoteness of this park and the harshness of life in the desert make it a compelling place to spot wildlife, and visitors will be able to do so on self-drive safaris without the crowds of more popular parks. Other than self-drive safaris, there are several other activities that visitors can enjoy. Morning and sunset guided drives are available at all three Rest Camps as well as the Kalahari tented camp, although they are not necessarily offered every day. The Nossob Rest Camp features a predator centre where visitors can learn about the park’s carnivores. Nossob and Mata-Mata Rest Camps have waterhole hides from where visitors can observe animals that are drawn to the water to drink. Day walks are also available from all three Rest Camps and can be booked at camp reception. Winter, around May to August, is the best time of year for seeing wildlife in the park. This is when water is at its scarcest and animals are drawn to waterholes to drink. Days are cool but temperatures at night can fall below freezing. There is practically no rainfall at this time. It is possible to enter the park as a day visitor but due to the size of the park, a recommended stay would be longer than this. The ideal amount of time is at least four or five days and possibly a week. This allows time to visit several different camps with enough time to participate in other activities available such as bushwalks. Staying for up to a week also maximises the chance of seeing the animals you hope to spot. There are three basic types of accommodation available at the park. There are three traditional Rest Camps with a range of accommodation options including cottages, family chalets and campsites. All Rest Camps include a reception, shop, fuel service and swimming pool. Only one Rest Camp has a restaurant. The six Wilderness Camps provide only basic facilities. Accommodation is in tents, stilted tents, chalets, log cabins or luxury lodges, depending on the Camp. There are cooking facilities and water for washing but visitors must bring food, drinking water and firewood. Wilderness Camps are unfenced but a tourism assistant is always on duty. This is a 24-bed luxury safari concept lodge built in harmony with the surroundings. It overlooks a salt pan and features an observation deck and swimming pool. Staying in the !Xaus Lodge offers the chance to interact with the Mier and ‡Khomani San bushmen who own it. A 4x4 is not essential but is highly recommended since regular vehicles may find some of the roads challenging. Risk of contracting malaria in the desert is low. Most shops in the park do not accept credit cards so you need to bring cash. The park straddles the border of South Africa and Botswana. Once inside the park, you are free to travel either side of the border. If you enter and exit the park through the same gate, there is no passport control. It is possible to enter the park from South Africa and exit into Botswana or vice versa but if you plan to do this, you will need show your passport and go through immigration procedures when entering and exiting the park. For those willing to make the journey to the Kgalagadi Transfrontier Park in this remote corner of the Kalahari, the rewards are ample. This park offers the chance to drive into the bush in search of spectacular wildlife in a much less-commonly visited part of the continent. The chance to observe some of Africa’s most recognisable animals continuing their daily fight for survival in this inhospitable land is a true wilderness experience that few other places can match.